Indeed. Not since Star Wars has there been so much back story behind one "legend." A long time ago, in this galaxy far, far away, a group of scientists on the planet Arus created a robot named Voltron as the ultimate defense system. But bad guy Zarkon had it out for the robot, and after being defeated several times in his futile attempts, he sent his witch Haggar to do his dirty work for him. Disguising herself as a goddess in distress, Haggar put a curse on Voltron that split him into five lion-shaped pieces and forced him into hibernation. Lucky for Voltron, a band of space explorers came along sometime around the 25th century and discovered the five sleeping lions. And none too soon, as Zarkon had already established his reign over the galaxy. Each space explorer piloted one of the lion pieces. The leader of the group was Keith, who helmed the Black Lion and directed the formation of Voltron. Lance, the pilot of the Red Lion, was the sassy one, never missing an opportunity for a sarcastic comment. The Blue Lion pilot was the Norwegian Sven, alhtough he was replaced early in the series by the beautiful Princess Allura and her caretaker, Nanny. The tough guy of the pack, Hunk, piloted the Yellow Lion, while the Green Lion pilot, Pidge, was remarkably agile despite his outward geekiness. When the danger got really heavy (and thankfully, it did in every episode), the five lions would form the feet, legs, arms, torso, and head of Voltron. The assembled mega-robot wielded the mighty Sword of Arus in the defense of his people and planet. A host of other characters made this galaxy a bustling one. There was Koran, the worry-wart diplomat of the Castle of Lions (Voltron's base of operations), and Allura's dead father, King Alfor, who would appear to his daughter in frequent visions. And then there were the evil folk. At Zarkon's side was his right-hand man, the ineffectual Yurak, and Zarkon's son Lotar, who desired only to take his father's place as King of Planet Doom [Planet Galra]. Hagar had her own cronies, including a group of evil monsters known as Robeasts, which were about as effective as a group of Stormtroopers. 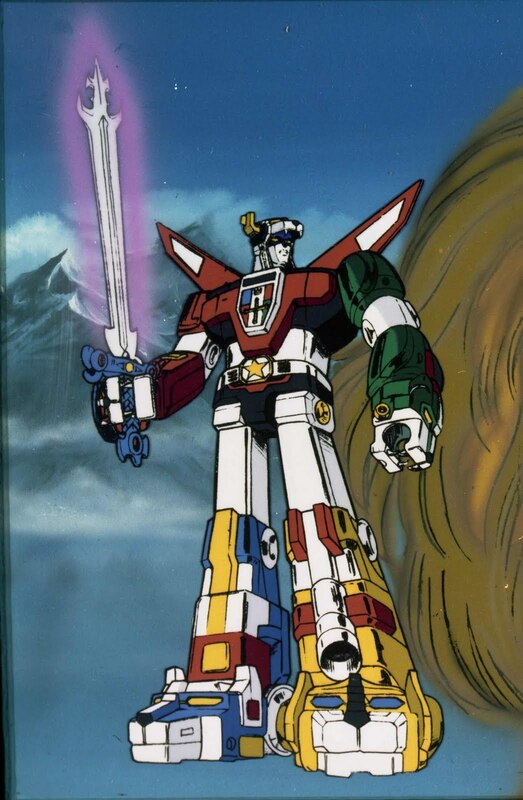 Voltron: Defender of the Universe came to the U.S. in 1984 and took America's youth by storm. A second series featured an all-new Voltron, this one composed of fifteen space exploration vehicles fighting the alien Drules. Titled Voltron: Defender of the Near Universe, the new show never gained the popularity of the "Lion Force," fading into relative obscurity over the years. In 1998, the original five-lion Voltron returned for the computer-animated Voltron in the Third Dimension. In Japan, TV series are made with a set number of episodes in mind, while the duration of American programming depends upon its popularity. Due to Voltron's high ratings, World Events Productions expanded on the original fifty-two Golion episodes by producing twenty more. They bought the rights to Golion from Toei, wrote twenty scripts and had a Korean company animate them. The episodes (called the "Second Season" of Voltron) were aired from 1986 - 1987. Among the changes to the season were two characters: Cossack, a clownish character who fills the role of the bumbling subordinate played earlier in Season One by a short-lived character (Yurak, Lotor's predecessor) and Queen Merla, a powerful and suave warrior who comes to Planet Doom with an entourage of nobles and soldiers she calls "dwarflings." A classy, cool-headed woman, she attempts to gain the throne of Doom in a short-lived marriage to Lotor, but the prince can never abandon his obsession with Allura. Due to the hurried effect of the season, the writing and animation suffered, and Merla's character was not used to full advantage. In addition to the 20 new episodes, a one hour special was made titled "Fleet of Doom", It had a crossover with the Vehicle Force Voltron, in which they were called in to cover for an incomplete Lion Force Voltron. But then both Voltrons teamed up to take on four Robeasts and defeat the forces of planet Doom. Centuries ago, there was fierce warrior robot known only as Go-Lion, who boasted that no opponent could defeat him. Soon he wound up facing a winged goddess who was appalled by his arrogance, so to humble him, she had him split into five lion mecha which ended up on the planet Althea. In the year 1999, Earth was in the grip of a devastating war. The only ones who survived the carnage were five youths in a space shuttle: Keith Kogane, Isamu Kurogane, Hiroshi Suzuishi, Tsuyoshi Seido, and Takashi Shirogane. Their ship was captured by a battlecruiser from the Galra Empire, ruled by the despotic tyrant Emperor Daibazar whose main aide was a witch named Honerva. The five youths managed to escape in a stolen ship to Althea. While making their way to the ruins of an ancient castle, they met the beautiful Princess Fahra and her military advisor, Raible, who sought their help in reviving Go-Lion to defend Althea from monsters from Galra. They succeded in doing so, but not long afterwards, Shirogane was killed by Honerva, forcing Fahra to take his place as pilot of the Blue Lion. Later, Daibazar's son, Crown Prince Sincline, who's every bit as cruel as his father, shows up to battle the Go Lion team. Eventually, the Go Lion team, joined by Princess Omuvei and Takashi's younger broher, Sho Shirogane (aka "Sven II" in Voltron), take the battle to the planet Galra. In a nutshell, Daibazar became a beastman and was destroyed by Go Lion, Honerva disappears, and ultimately Sho and Sincline fight each other to the death. The threat of Galra ended, and our heroes live peaceful lives on Althea afterwards.